There&apos;s a hip new dining option on iconic South Congress Avenue. Café No Sé, an all neighborhood cafe, opened alongside the new South Congress Hotel in early September. The California-inspired eatery serves breakfast, lunch, dinner, weekend brunch, and features a late-night menu until midnight on weekends. Executive Chef Michael Paley, formerly of the 21 Museum Hotels in Louisville and Cincinnati, has created an eclectic, seasonal American menu with global influences that range from Italy to the Middle East. Try the ricotta gnudi with grilled corn, charred sugar snap peas and basil. Or opt for the café cheeseburger, a double patty of Pat LaFrieda beef topped with Vidalia onion and housemade pickles on a fresh-baked buttermilk brioche bun. You&apos;ll find the cheeseburger on every Café No Sé menu-even breakfast. Add a sunny egg or crispy bacon, then wash it down with a locally roasted custom Café No Sé blend of Cuvée Coffee. You&apos;d be remiss to skip dessert, no matter when you dine. Executive Pastry Chef Amanda Rockman, a 2015 James Beard Foundation Award semifinalist, showcased her inventive, playful approach to sweets when she participated in Top Chef: Just Desserts. Try her chocolate flan tart with peanut curry and candied krispies, or a scoop of assorted housemade ice cream and sorbet flavors, including toasted sesame or passionfruit sherbet. 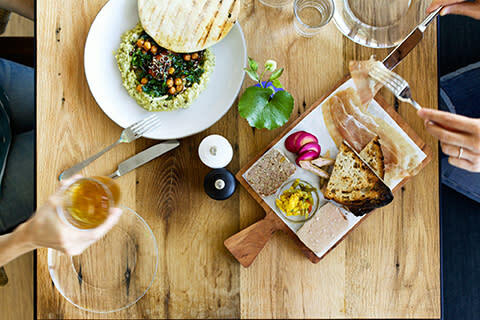 Café No Sé offers indoor and outdoor seating along Austin&apos;s vibrant South Congress Avenue, inviting locals and travelers alike into its bright, airy interior. The restaurant is located inside the newly opened South Congress Hotel, a stylish boutique hotel featuring 71 rooms and 12 suites and a pool overlooking South Congress Avenue and the downtown Austin skyline. Each guest room and suite features a locally curated minibar, a dedicated Wi-Fi network, and complimentary on-demand access to more than 40 features and documentaries by Drafthouse Films. Later this fall, South Congress Hotel will debut Central Standard, an American bar and grill, and Mañana, a coffee and juice bar. Otoko, a 12-seat omakase Japanese restaurant by James Beard Foundation Award winner Paul Qui, will open in 2016. Retailers Sunroom, Revival Cycles and tenoverten nail salon are slated to open in the hotel by the end of the year. Café No Sé is located at 1603 Congress Avenue on the corner of Milton Street and South Congress Avenue. Reservations are now available at cafenoseaustin.com or by calling 512-942-2061. Follow Café No Sé on Facebook (Cafe No Se), Twitter (@CafeNoSeATX), and Instagram (@CafeNoSeATX). For more on South Congress Hotel, visit southcongresshotel.com.